Disney have unveiled plans to create their own augmented reality (AR) headset. 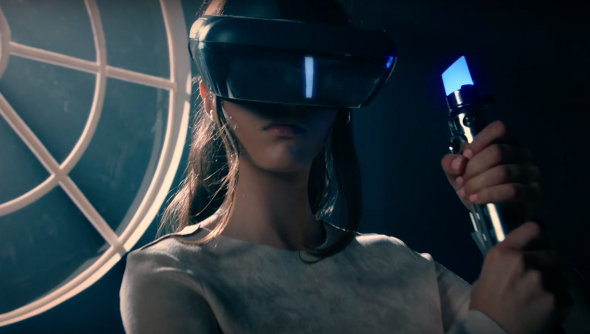 During D23’s recent Level Up videogame panel, Disney revealed they’ve partnered up with Lenovo to manufacture new augmented reality hardware, and also shared a brief glimpse of Star Wars: Jedi Challenges, an all-new Star Wars experience. New to VR? Here are the best VR games on PC. The teaser (above) doesn’t give up much, let’s be honest, but there’s going to be AR lightsabers and holochess apparently, and that’s probably all people care about, right? We don’t yet know release date or pricing information, but for more, head on over to the official website (although you might want to try later – right now it seems to be struggling with demand). That’s not the only big news to come out of D23, incidentally. If you missed it, EA also partnered up to show off a behind-the-story teaser video for Star Wars: Battlefront II and it looks all kinds of amazing.